Is Ammonia the Best Oven and Floor Cleaner? Ammonia cleans floors, microwaves, and ovens with burned-on food. But is it the best way to go in order to clean your home? Ammonia, which is a compound of nitrogen and hydrogen, is often touted as a "natural cleaner," but this is one instance when natural isn't always best. Ammonia is known for its very pungent odor. The smell alone can cause irritation to people with breathing problems. Your eyes may begin to tear up as soon as you smell it, even in the low concentrations that are usually reserved for household cleaning. It's that strong. Many people get turned off by the smell and wonder how something that stinks so heavily can clean so effectively. But ammonia is an effective cleaner and, handled correctly, it's safe. Ammonia can be used effectively as a cleaner for mirrors and glass, and it is cheap compared to some other cleaners. That's just one advantage to cleaning with ammonia. Don't use ammonia as a floor cleaner for no-wax floors. Over time, the ammonia can cause damage to the floors. Read the instructions on the bottle carefully, because it must be used and stored safely. The instructions can also tell you about how to effectively dilute ammonia, and what to do in the event of an accident with ammonia cleaning. 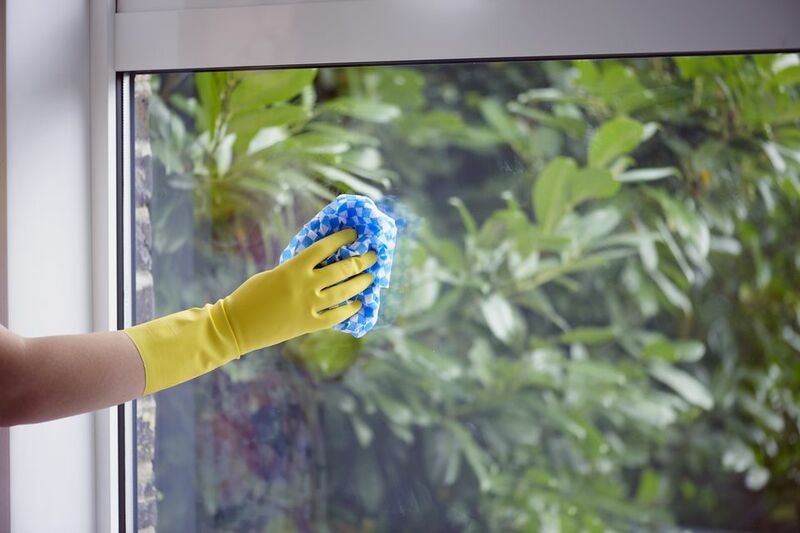 Solutions of ammonia (5 percent to 10 percent by weight) can be used as a household cleaner—specifically for glass. The ammonia solution can be irritating to eyes and mucous membranes. It can also irritate skin when it comes into contact with the body. Never mix ammonia into any liquid that includes bleach, because it could generate a poisonous gas. Ammonia works great in microwaves to loosen food particles but boiling a bowl full of water works just as well. The steam from the water loosens cooked on food without the fumes of ammonia. To clean your oven with ammonia, warm it to 150 F and then turn it off. Put 1/2 cup of ammonia into an oven-safe bowl on the top shelf and a pan of boiling water on the shelf beneath it. Shut the door and let it sit overnight. Some people claim that leaving a dish full of ammonia overnight in an oven will loosen baked-on food. However, you might find that the fumes are unbearable. Try a fume-free oven cleaner or baking soda paste to clean caked-on dishes.